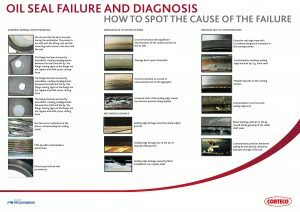 Often, when parts such as oil seals fail prematurely they are replaced and returned under warranty; however, in most cases the seal itself isn’t the reason the failure has occurred. In this guide, we will take you through the causes and how to avoid premature leaks and failures in the future. If the lip has worn out then this is often caused by the seal not being sufficiently lubricated before installation causing abnormally high temperature, the presence of foreign matter, disproportionate internal pressure or an excessively rough shaft surface. Similarly if when removing a seal, if the lip has hardened and there are visible cracks, you can be sure that this has again been caused by abnormally high temperatures, excessive internal pressure or insufficient lubrication. The cause for the abnormally high wear has occurred due to friction as the amount of lubricant was below the specified level and therefore did not reach the seal lip. Alternatively, insufficient lubrication can come from dry-wear conditions because the vehicle’s oil levels are low. Another sign of this is if the lip wear band is smooth and glossy. Alternatively, if the lip has softened, then the main cause of this is the lip having the incorrect material required for the application. In order to prevent this from reoccurring make sure the correct seal is sourced for the specific application before installation. If you notice the lip of the seal has worn unevenly then this is due to cocked seal installation or an excessive shaft offset. As before, both should be checked during installation but crucially before the vehicle is out on the road. Installation errors tend to be a big factor in automotive parts failing prematurely. This is apparent if you can see that the lip of the seal is scratched, caused by improper assembly, improper handling, an incorrect shaft chamber or the presence of foreign matter entering the seal. The scratches are often caused by being assembled over burrs or other defects in the shaft chamber, the lip coming into contact with sharp metal parts during transit or storage or if the seal was handled with gloves contaminated with metal particles. As stated improper handling can be a factor in causing a seal to fail prematurely, the tell-tale sign is the seal lip being swollen or soft. The swelling is caused by the lip being soaked in solvents or petrol before installation. Alternatively, if when removing a seal you see the fit trace is disconnected locally then the seal could have been deformed because of an improperly designed assembly jig or a gap in the press-fit occurred due to rough handling. However, although problems during fitting can contribute to the part failing, other issues may be the key factor. If the lip’s waist (flex area) is broken, then this can be because of improper assembly but can also triggered by excessive internal pressure. Similarly if the lip is turned-under, the lip edge is severely worn and the wear band is concave then this is connected to an incorrect shaft chamber, improper assembly and excessive internal pressure meaning the oil seal area exceeded the maximum pressure it was originally designed for. To prevent this reoccurring, identify the maximum pressure for the seal and check it is compatible with the vehicle. However, if the lip edge is severely worn but there are circumferential grooves on the wear band then the cause is that the shaft finish was rougher than the specified range again this can be prevented by sourcing the correct part for the specific application. Similarly, if the lip edge is severely worn and there are grooves or indentations on the surface. Foreign matter can affect the seal in many ways whether the cause is due to a shaft or seal that has been contaminated with foreign particles being used or the contaminants were embedded in the seal lip. The cause can be triggered when the seal is assembled in the presence of dirt and/or dust causing the contaminants to become embedded in the sealing lip. In addition, if the seal or the housing was assembled with silicone, the sealant will have contaminated the shaft or seal. If, when removing a seal the garter spring has become disconnected then this has likely been caused by an incorrect shaft chamber or improper assembly, checking the installation can ensure you and you customers are happy with the finished job. However, if there isn’t an obvious fault with the oil seal, the cause is often difficult to diagnose, but before you prematurely condemn a good seal first check if the shaft is scratched or the diameter is incorrect, if the shaft rotational direction does not match the helix on the seal, there is excessive shaft offset or runout, the shaft is worn or the seal has been installed incorrectly. 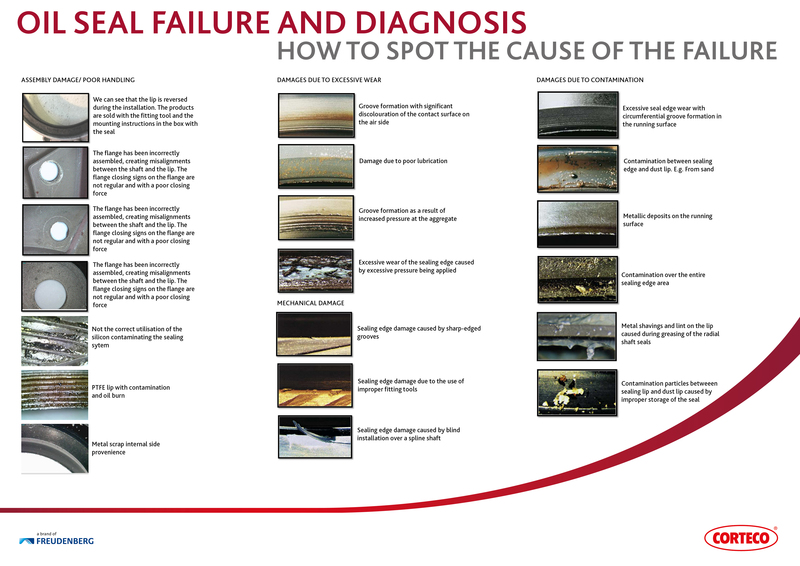 Below we identify four common causes of premature leaks due to incorrect handling/installation. If the oil seal is cocked then this can be caused by an improperly sized bore diameter, incorrect shaft chamber or improper assembly jig. Like with the lip leakage diagnosis if the oil seal is problem free, check if there is a scratched or an improperly sized bore or excessive bore surface roughness. Similarly if the seal OD is damaged or chafed the bore is often the cause. Ensure you check if there is an improper sized bore diameter, incorrect shaft chamber or improper assembly jig before installation. All the causes mentioned can be avoided if the correct steps are taken when assembling, ordering and fitting a part. Head over to www.corteco.com/en/products/sealing/ to view our sealing range.